MainAll NewsInside IsraelIs Israel Planning a Final Exit from Homesh? Is Israel Planning a Final Exit from Homesh? Jews are still banned from entering Homesh, but PA Arabs, according to a new government order, are now allowed into Homesh. Eight years after the "disengagement" from Gaza and northern Samaria, when 9,000 Jews in dozens of communities – including Homesh in Samaria (Shomron) – were thrown out of their homes, the government is now reportedly preparing to turn the area over to the Palestinian Authority. Homesh was one of four northern Samarian towns which Jews were evicted from as part of the disengagement. 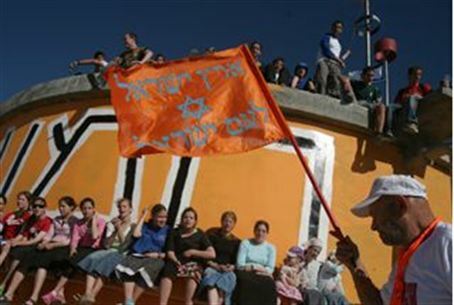 Unlike the towns of Gush Katif, however, the towns were not handed over to the PA, and the IDF maintained a presence there. Since then, former residents and activists have sought permission to return to the site, and dozens of MKs have signed onto a law that would allow the resettlement of the town by Jews. But the office of the government's legal advisor for Judea and Samaria announced that it would support transferring Homesh and other former Jewish towns over to the PA. Homesh is still in Area C of Judea and Samaria, meaning that it is under Israeli civilian and military control, but the government's legal advisor said, in a letter to leftist organization Yesh Din, that the government no longer opposes the entry of PA Arabs into the town, which had heretofore been prohibited. In the letter to Yesh Din, the advisor said that Homesh was no longer on the list of Jewish towns in Judea and Samaria, meaning that PA Arabs could now freely enter the area. However, Israelis are still banned from the town, based on orders by the military government issued after the disengagement. Observers said that the move could be a precursor to the reclassification of the town as Area A or B – placing it under total or partial PA control. Commenting on the move, Samaria Council head Gershon Mesika said that “the government once again shows that it leads the way in damaging the interests and rights of its citizens. It appears that we do not need enemies. Homesh has until now been a part of Area C and has not been handed over to the PA, as was Gush Katif. Even so, Israelis were banned from entering the town, and to add insult to injury, PA Arabs will now be allowed to enter the area.